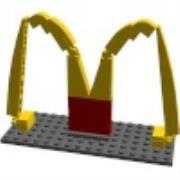 I'm starting to work on a Mcdonald's MOC and I just got done finishing the M logo. The red panel in the bottom center would have the sticker from 3438. I was just hoping for some feedback and if there is a better way to make that M.
It's a good start, but I think the shape could be better. 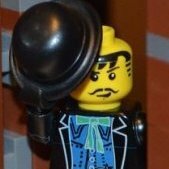 Perhaps try to achieve the desired shape in real bricks, without worrying about colors, if you don't have a large collection. Then when you have an idea of how the shape can be best achieved, make it in LDD in the right colors. It's just a suggestion, of course, but I know that LDD can be quite tricky (For me anyways) and all that. Great start, keep it up!